These are great little cookies. 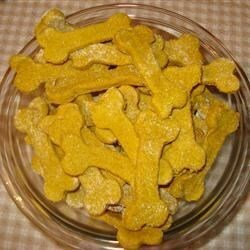 Having two dogs, we go through a lot of treats while training them. Plus sometimes their just so cute, that I can't resist a little treat. Anyways, the cost adds up and I always wonder what is in a dog biscuit. So I made my own with things we all have in our kitchens. Try em' out and let me know what your furry friends say! *Yes, these are human edible, but I wouldn't recommend them.